dedicated to serving the young people of the Princeton NJ area. Meets preceded with a blue background denote groups from which a team meet will be selected when more information becomes available. Non-team meets are listed for informational purposes, and may subsequently be added as a team meet. Any swimmer can participate in a non-team meet by entering on their own. LOCATION: 157 West 16th St, Bayonne, NJ. 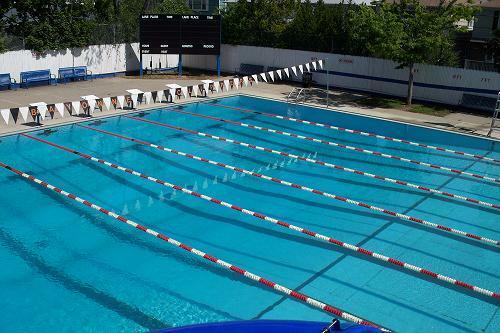 DESCRIPTION: A eight lane 50 meter outdoor pool with 7 ft lanes utilizing anti splash lane dividers, Colorado Timing, and computerized results. PLEASE BRING YOUR OWN CHAIR (BEACH, ETC) SINCE NO SEATING WILL BE PROVIDED. Parking is available at the DiDomenic Park located at the end of West 16th St. The depth at the starting end is 9 feet and the depth at the turn end is 4 feet. LOCATION: 2000 Pennington Rd, Ewing, NJ 08628. Directions to the campus, information about the aquatics center, and a campus map are available from the TCNJ web site. DESCRIPTION: At an expense of 4.5 million dollars, The College of New Jersey Aquatic Center opened in 1987 as one of the finest indoor aquatic facilities in the northeast. Measuring 126 feet by 67 feet, the pool is divided by a moveable bulkhead separating the diving well from the main pool. The diving well measures 67 feet by 48 feet and has 2 one-meter and 2 three-meter diving boards as well as 3 lap lanes. 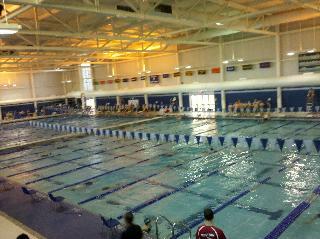 The main pool has 8 lap lanes that are 25 yards long. From PA Turnpike: Exit 28- after tollbooths take US 1 North towards Morrisville. Proceed to 95 North (this is not the NJ Turnpike) towards Trenton. Follow From 95 North directions. From Route 95 North: Proceed over the Scudders Falls Bridge into NJ. Proceed to Exit 4A, Route 31 South. Exit right onto 31 South. The first traffic light has three gas stations and a 7-11 on the respective comers. Proceed through this intersection to the next traffic light. Turn left into the Trenton State College entrance. Immediately bear to the right. Go approximately 0.3 miles to parking lot 3;3A on your left. The parking lot entrance is immediately after a large mound of dirt. At the far right side corner is the football/soccer stadium. There is a walkway leading from this corner to a brick building. This is the pool/gym. From North New Jersey: Take Route 1 south to 95 South (this is not the NJ Turnpike) towards Philadelphia. Proceed to Route 31 exit. Turn left at end of ramp onto 31 South. First traffic light has three gas stations and a 7-11 on the respective corners. Proceed through this intersection to the next traffic light. Turn left into the Trenton State College entrance. Immediately bear to the right. Go approximately 0.3 miles to parking lot 3;3A on your left. The parking lot entrance is immediately past a large mound of dirt. At the far right side corner of the parking lot is the football/soccer stadium. There is a walkway leading from this corner to a brick building. This is the pool/gym. DESCRIPTION: The new 6 lane, 25 meter Competition Pool features water depths from 4 to 5 feet and is fully equipped with Kiefer anti-turbulent lane lanes, KDI Paragon starting blocks, and a fully automatic Colorado timing system. From New Jersey: Take the PA Turnpike West to Exit 21 (Lancaster-Reading). Proceed straight from the toll booth to the light. Turn left onto Route 272 South and follow it to Route 322 East. Take Route 322 East through the next traffic light and across the bridge. After the bridge, make a sharp right turn and proceed to the stop sign. The pool is straight ahead. LOCATION: located near Wrightstown, NJ and Pembertown, NJ. Building 5901, Doughboy Loop , Fort Dix , NJ 08640. DESCRIPTION: The pool consists of a six-lane, 25 yard competition pool with Competitor non-turbulent lane lines, Colorado electronic timing system, six-lane scoreboard, and Paragon starting platforms. In addition, there is a four-lane, 20 yard warm-up pool. From New Jersey-North (NJ Turnpike): Take the New Jersey Turnpike to Exit 7. After exiting the turnpike, take Route 68 towards Wrightstown following signs for Fort Dix. At the Fort Dix Circle, take the second right and continue to the light. At the light, turn right. After a short distance, turn left onto 8th Street. At the first light on 8th Street, turn right. The pool is 500 yards ahead on the left. From New Jersey-North (Route 295): Take Route 295 South to Exit 57 (Bordentown). After exiting 295, take Route 130 North to the first light after McDonalds. At the light, turn right onto Route 545. Take Route 545 to the first light. At the light, turn right onto Route 206 South. Follow Route 206 South to Route 68. Take Route 68 towards Wrightstown following signs for Fort Dix. At the Fort Dix Circle, take the second right and continue to the light. At the light, turn right. After a short distance, turn left onto 8th Street. At the first light on 8th Street, turn right. The pool is 500 yards ahead on the left. DESCRIPTION: The aquatic center consists of an 8-lane 50-meter pool that can be set up as two separate 25-yard pools running simultaneously. GCIT features platform blocks, Colorado timing systems with an 8-line display for one pool and a 1-line display for the other. Minimum depth is 5 feet. Directions to the campus are available from the GCIT web site. From North New Jersey: Take 295 South towards Camden. South of Camden get on Route 42, the Atlantic City Expressway. After you pass the two lane exit for the Delaware Memorial bridge, stay to the right because you will get off soon at Route 55 South. Take 55 South a short distance to exit 56B. Get on to Route 47 heading towards Woodbury and Westville. As soon as you get on to Route 47 (Delsea Dr.), get over to the left because you will be taking your first left turn on to Bank Bridge Rd. There will be a middle school on your left at the next comer. Turn left at the school onto Tanyard Rd. G.C.I.T. will be your next left. As you enter the campus, parking will be on your right and the pool on your left. Gloucester County Community College is nearby (don't go there by mistake). There should be signs for G.C.I.T from Route 55. LOCATION: 217 Walnut Lane, Princeton, New Jersey 08540. From DeNunzio Pool: Take Hartley Ave/Faculty Rd to Harrison Street. Left at the light onto Harrison Street. Left at the light onto Hamilton Ave. (First light after Nassau Street). Right onto Walnut Lane. Right onto Guyot Ave (After the school main entrance). Parking lot on your left and pool enttrance on your right. LOCATION: 25 Leshin Lane, Hightstown, New Jersey 08520. From DeNunzio Pool: Take Washington Road to the Route 1 circle. Go around the circle, and take Route 571East / Princeton-Hightstown Road. Cross Route 130, and continue to the "T" intersection. At the "T", turn right onto Main Street. Bear to the right. Pass the Post Office, Getty Station on the right - Gulf Station on the left, turn left onto Grape Run Road. Go to the first right onto Leshin Lane. From North New Jersey: Jersey Wahoos is located just off southbound Route 73, behind Bennigan's, just below Route 295 and the New Jersey Turnpike. From Route 295, take exit 36B onto Route 73, south. Or, from the New Jersey Turnpike, take exit 4 onto Route 73 south. Continue on Route 73 south and make a right turn into Bennigan's. Proceed to the parking lot in the rear of Bennigan's. You may park in this lot or in the Wahoos' parking lot. LOCATION: 1200 Langhorne-Newtown Road, Langhorne, Pennsylvania. From Route 95: Take I-95 to the Newtown exit. Take Rt. 332 (towards Newtown) to Rt. 413. Make a left onto Rt. 413. The school will be at the first light about a ½ mile ahead across from St. Mary’s Hospital. Make a right into the school. Park in the lot behind the school. Enter through doors marked pool. From PA Turnpike: Take the PA Turnpike to (Exit 28 – Phila). Take Rt. 1 North to Rt. 413. Exit at the Langhorne Rt. 413 exit. Go North on Rt. 413 for 4 lights. The school will be on your left, across from St. Mary’s Hospital. Park in the lot behind the school. Enter through doors marked pool. LOCATION: 155 Etra Road Hightstown, NJ 08520. DESCRIPTION: The pool is located in the Aquatic Center. 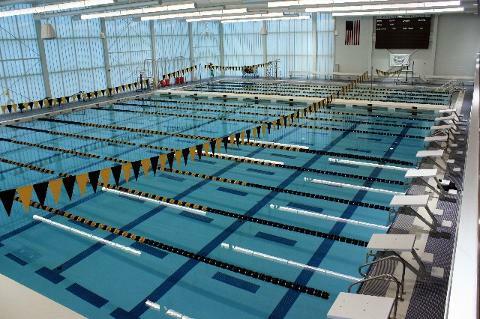 The pool measures 25 yards and has six competition lanes featuring Colorado timing. There is no separate warm-up pool. DIRECTIONS: A campus map and directions to the college are available from the Rider University web site. DESCRIPTION: has its main campus in New Brunswick and Piscataway, New Jersey. The Sonny Werblin Recreation Center on the Busch Campus. DIRECTIONS: A campus map and directions to the aquatics center are available from the RU web site. DESCRIPTION: The aquatics center is located in The Richie Regan Recreation and Athletic Center. DIRECTIONS: Campus map of the university is available from the SHU web site. DESCRIPTION: The Physical Education Building is also home to a six lane, 25 yard pool since the building was originally constructed in 1975. Currently, the pool is scheduled by the Somerset Valley YMCA and maintained by the Raritan Valley Community College Facilities & Grounds Department. From Route 195: Take I-195 to exit 3B - Hamilton Square. Make a left at the second traffic light (Klockner Ave.). Steinert High School is now on your right. Follow Klockner through the third traffic light (Hamilton Ave.). Nottingham High School is on your left. The pool entrance is in the rear of the building. From Route 295: Take I-295 to the NJ Route 33 East, Trenton exit (Nottingham Way). Go to the first traffic light and make a left onto Klockner Ave. Nottingham High School is on the right before the next traffic light. The pool entrance is in the rear of the building.